Japan early Monday shut down its last functioning nuclear reactor for stringent new checks by the country’s new regulatory body, with no timetable for a restart, leaving the heavily nuclear dependent country without atomic power for the third time since the 1960s. Kansai Electric Power Co (Kepco). 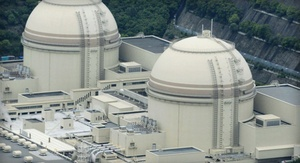 confirmed reactor no 4 stopped generating power early Monday morning at its Ohi plant in Fukui prefecture in western Japan amid ongoing hostility toward nuclear power since the March 11, 2011 tsunami that hit Tokyo Electric Power Co (Tepco’s) Fukushima Daiichi plant, causing three meltdowns and ongoing radiation hazards. Workers at the stricken Fukushima Daiichi plant are meanwhile are bracing for a powerful incoming typhoon while technicians struggle and fail to keep increasing leaks of irradiated water from the facility under control. In addition to leaks at tanks containing highly irradiated water, around 300 tons of mildly contaminated groundwater is entering the ocean every day having passed under the reactors. Typhoon Man-Yi hit southern Japan Monday morning, bringing heavy rains and strong winds and sparking fears that it might further deteriorate the situation at Fukushima Daiichi, the Japanese television broadcaster NHK reported. Workers at the site are using large weights to try and prevent cranes used to move debris from toppling over in high winds, said NHK. They also attached ropes to external piping and pumps, which are used to pump cooling water to and from the reactors. Staff members have increased patrols ahead of the storm to make sure that radiation-contaminated water doesn’t overflow from storage tanks. At least one overflow has already been discovered NHK reported. “We are on alert for the possible impact of the typhoon at the plant, while pumping out water from areas near the tanks as rain continues intermittently,” said Shogo Fukuda, a Tokyo Electric Power Co (Tepco) spokesman told The Australian. The ongoing leaks at the plant are a huge concern, as Japanese authorities and its operator, (Tepco) have so far failed to prevent leakage of radioactive water used to keep reactors under control into the environment. With Ohi’s No 4 reactor shut down, all 50 of the country’s reactors are now offline, and the government isn’t making any promises about when, or if, they will come back online. The country had previously relied on nuclear for 30 percent of its energy mix. Analysts who spoke with the BBC suggested Japan will be without nuclear power until December at the earliest. Prime Minister Shinzo Abe has openly supported a return to the widespread use of atomic energy, but the public remains largely opposed on safety grounds. Bøhmer said he hoped the long shut down period would give Abe’s government a chance to reconsider. The new round of checks being conducted by Japan’s newly-minted Nuclear Regulatory Authority (NRA) are touted as some of the strictest in the world, involving teams of up to 60 technicians inspecting each reactor in Japan for a period of up to six months, NRA officials told Bellona in interviews earlier this year. Rectifying faults will take even longer. And then, in order for any reactor to be restarted, bringing it back online will have to be approved by prefectural governments and the public – something Bøhmer predicts will be difficult to secure in Japan’s anti-nuclear climate. “These questions will be decided by local communities, where the reactors are, and I don’t think that the anti-nuclear sentiment after Fukushima can be dispelled,” said Bøhmer. Since the Fukushima Daiichi disaster, Japan’s nuclear plants have been closed, either for scheduled maintenance or because of safety fears, and have not been restarted. Japan went without nuclear power during May and June last year, but Kepco was allowed to restart two reactors at the Ohi plant to meet summer electricity demands. So far, Japanese utilities have applied to restart about 10 of Japan’s 50 reactors. Prime Minister Abe wants to see the reactors back on line, as they are a vital part of his plan to turn the economy around, saying that Japan’s trade deficits posted since 2011 come from huge amonts of coal, liquefied natural gas and other fuels the country has been forced to import. Since the Fukushima disaster, Japan has been forced to import huge amounts of coal, liquid natural gas and other fuels.